For week 14 of my 52 New Things I ran my first 5K. This may not seem like a big accomplishment to most, but for me, it is. For years I have had foot (and more recently knee) problems that have made walking or running long distances extremely painful. However, whether it was through yoga, training, or magic, within the past few months my foot problems, for the most part, have gone away. For my first race I wanted to do something fun, something that would be a memorable experience. 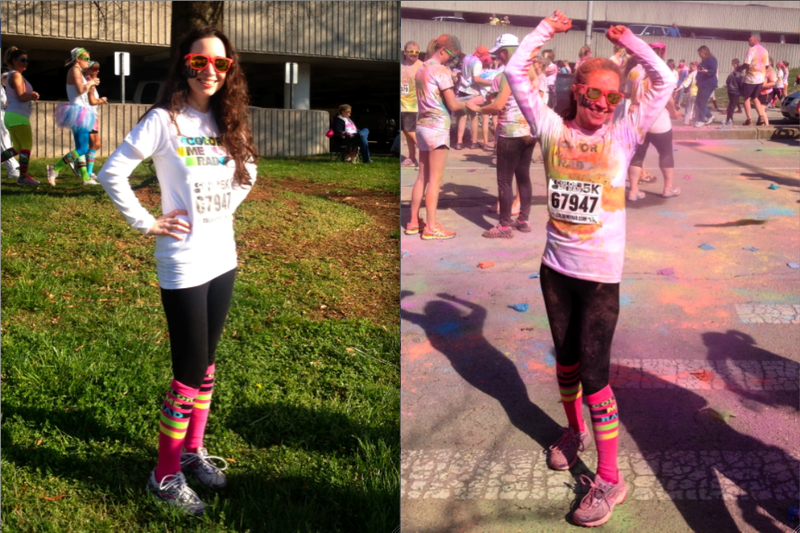 My friend Erin (who made candles with me on week 3) suggested Color Me Rad, which benefitted East Tennessee Children’s Hospital. She could not have picked a better race. 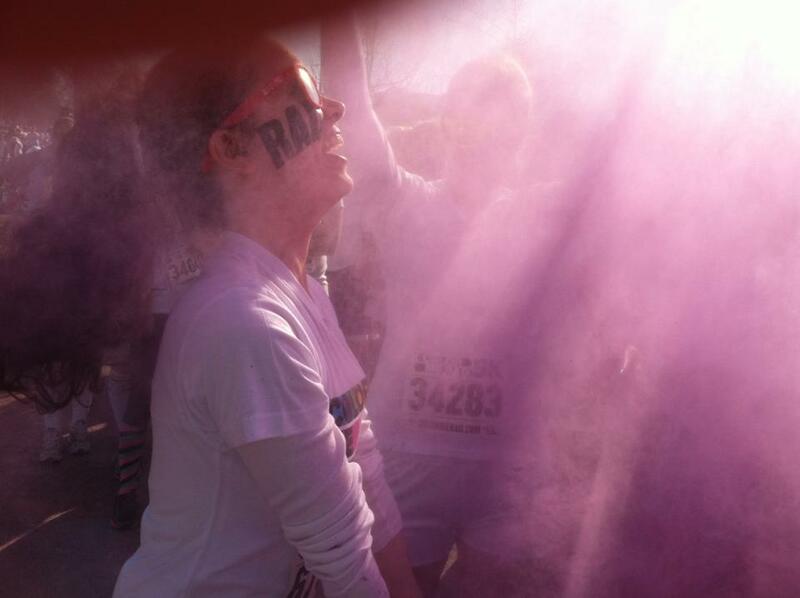 The thing that separates Color Me Rad from other 5Ks is that you are pelted with green, pink, purple, yellow, and orange color bombs (colored cornstarch) throughout the race. It is reminiscent of Holi, the festival of colors. The photo below is of me releasing my first color bomb over our friends before we started. Please note that my clothing is still clean and white at this point. When I woke up the morning of the race I was skeptical of how it would go. It was 35 degrees, I had a chest cold, and my knee was already bothering me. But, I layered up and decided it was too late to back out. Fortunately, it warmed up a bit to a sunny 43 degrees (6 degrees Celsius for you kids abroad) by the time our wave started at 10 a.m. However, the run and colorful distractions quickly warmed us up. 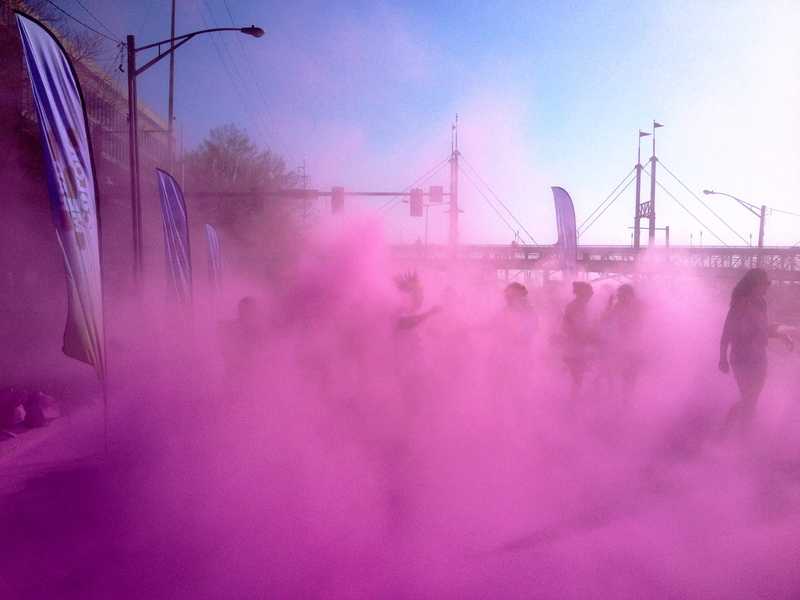 When we hit our first color station it was like running into a cloud of purple chaos. The clouds of paint were so thick that I lost Erin in them more than once. There were stations for both powder and watery paint sprays. 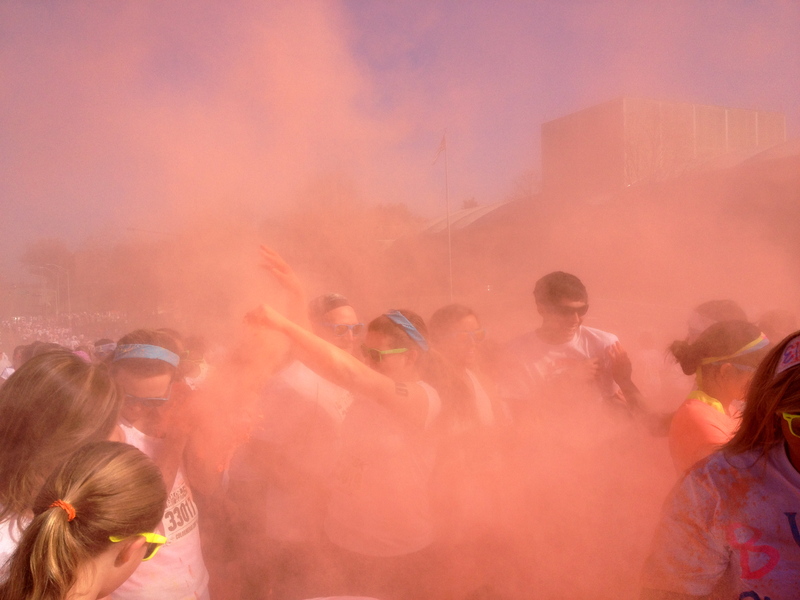 We got blasted with plumes of purple, pink, and orange, and sprayed down with yellow and green. We looked like a tie-dye factory exploded on us. Below is Erin getting covered in purple powder. Please take notice of the guy rolling around on the ground in the paint. 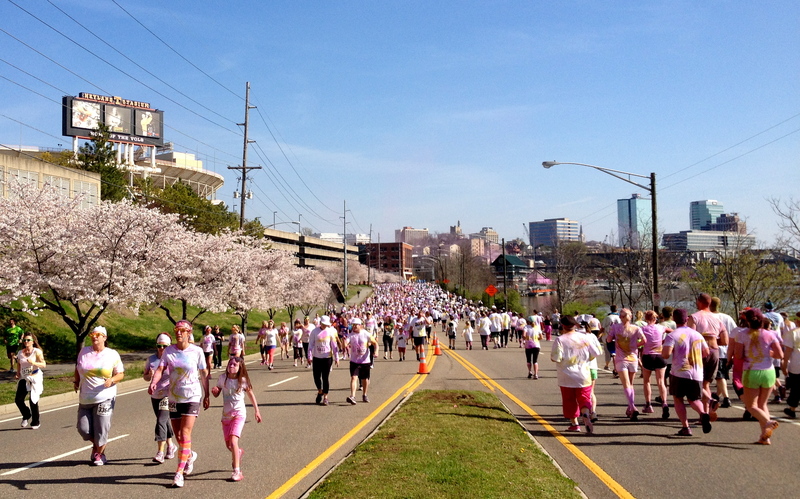 There were 9,000 participants, all decorated like Easter eggs. Here are a just a few running past Neyland Stadium. The race was a ton of fun. Physically, I fared better than I had expected. 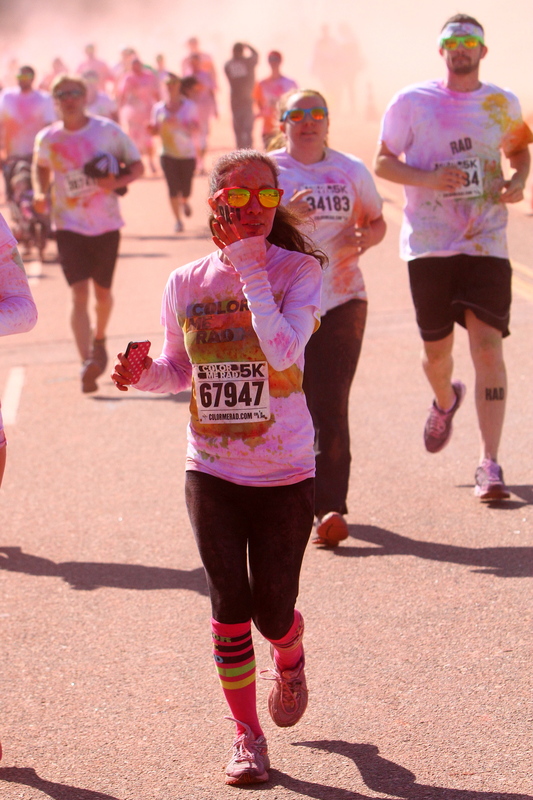 My knee and feet held up through the race, I think stopping 5-6 times for color bombs helped. My knee did start to bother me about halfway through and made climbing stairs difficult later that evening, but seemed back to normal by the next day. This is unusual for me and bodes well for future runs. As soon as we crossed the finish line they started playing Rocky Top. For those not from Knoxville, Rocky Top in the University of Tennessee’s unofficial fight song, one of Tennessee’s official state songs, and one of the greatest things ever written. (No, I am not biased at all. Why do you ask?) 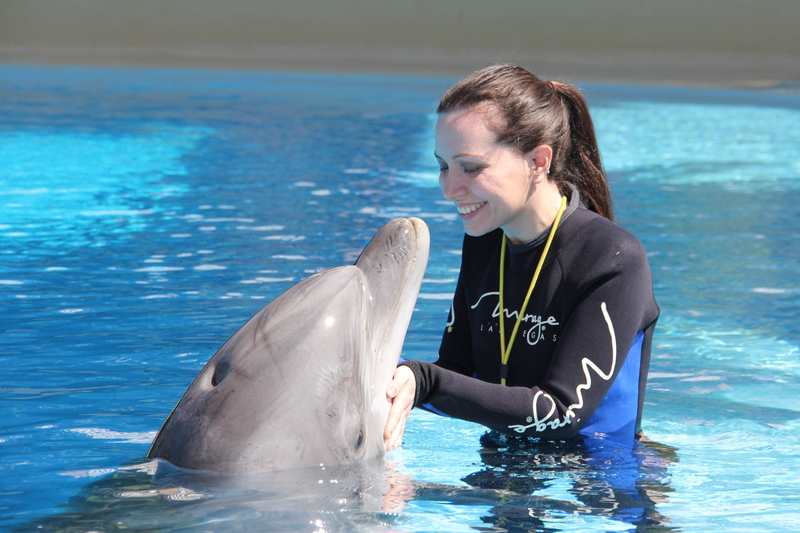 It was a great end to a pretty rad morning. I am looking for a fun 10K (or 8 to 10-miler) to run later this summer or fall, and hope to make it up to a marathon next year. Stay tuned; I am sure I will post about it here. Update: I got some shots from Color Me Rad actually running during the race. This one was near the end. Hello there! Interesting post and pretty photos! I am really looking forward to this run in my country as well! This year will be the first year it is held in Singapore, and it’s called the Color Run 😀 I’ll be running my first 5km in the Nike She Runs in May 🙂 And I do have some knee problems like you do 😦 Did you have to wear knee guard? 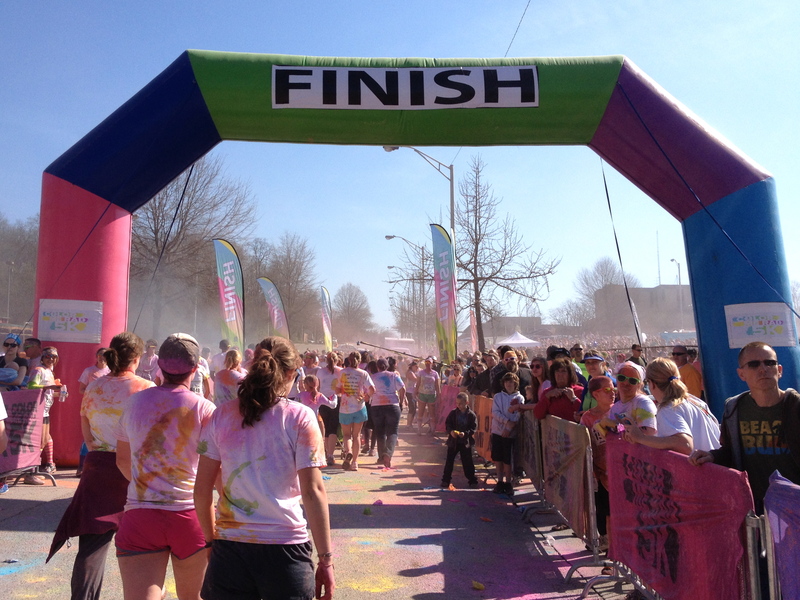 Have fun doing the Color Run! You’ll love it! I do not wear a knee brace, I just try to push though it. My problem seems to be IT band, so a brace won’t help it very much. But, it is getting better. Good luck on your first 5K! Are you saying that being a human easter egg is all it’s cracked up to be? 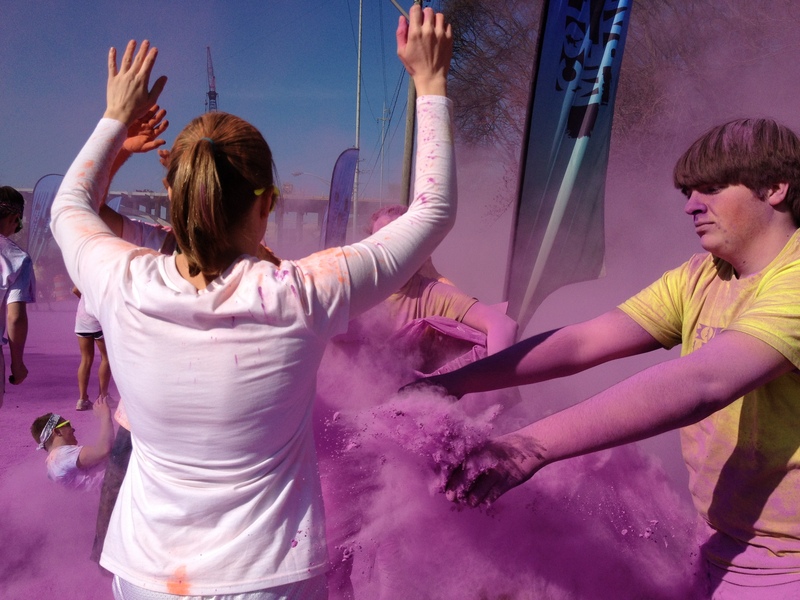 Does the color stay on your shirt from the run or wash out? Do you wish you would have gotten more color on yours; like the guy on the ground?